Reminiscent of the classic video game Pong, Bit.Trip Beat involves players moving an onscreen paddle in order to bounce off waves of incoming blocks to the beat of the music. As the player progresses through the game, the patterns of blocks become increasingly complex, but players can judge how well they are doing through changes in the graphics and music. The game is played by tilting the Wii Remote to move the paddle. 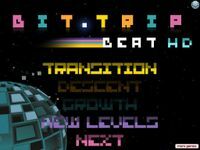 Bit.Trip Beat also features up to 4-player cooperative multiplayer. Source: Wikipedia, "Bit.Trip," available under the CC-BY-SA License.